Legend has it that the world's most famous want ad was penned by the explorer Ernest Shackleton. The ad is reported to have run in December of 1913 in The Times of London as Shackleton was seeking men to work the Endurance expedition to the Antarctic. It has been replicated, quoted from and is regarded as one of the greatest moments in advertising history. One such example of the Shackleton ad's popularity is in the art world. 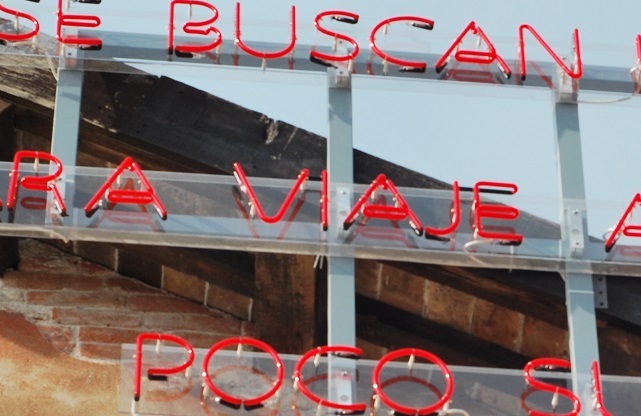 The above photo captures a Spanish translation of Shackleton's want ad in neon by the Instituto Italo Latino Americano (IILA) from the Venice Biennale in 2011. The only problem with the world's most famous want ad is that not only did it not appear in The Times of London in 1913 as legend has it but Shackleton never wrote it either. The first evidence of the want ad is found in the religious guidance book, Quit You Like Men by Carl Hopkins Elmore in 1944. It next appeared five years later in, The 100 Greatest Advertisements: 1852-1958 written by Julian Watkins. Watkins' book is the most referenced source for the origin of Shackleton's famous want ad. The dubious provenance of the Shackleton ad is such that the Antarctic Circle organization has a standing offer of $100 for anyone who can provide proof of the ad appearing before Ernest Shackleton's ill-fated Imperial Trans-Antarctic Expedition of 1914.